One of the most common questions I get asked is which type of chocolate to use. From experience I've found that I prefer using BELCOLADE chocolate. It's easy to microwave and as long as you don't overheat it your casts will come out nice and shiny. I get mine from amazon here: BELCOLADE CHOCOLATE. I wouldn't recommend buying cheap bars of cooking chocolate from supermarkets because they don't set very well and your casts are likely to break whilst demoulding. I'll describe below how to melt your chocolate using the double pan method, but if you'll be using belcolade chocolate it's MUCH easier to melt it in the microwave. Once you've got the hang of making a few chocolate casts I'd recommend learning more about how to temper chocolate if you're wanting to take up chocolate making full time. For both of the methods below I'd recommend making a large batch of melted chocolate before you start the moulding process. By doing this, you can leave your unused melted chocolate to one side whilst the moulded chocolate is setting in the fridge, (see below). Then when it comes to adding more chocolate to the inside of your eggs, you'll be able to get thicker layers because your melted chocolate will have cooled down just enough to be able to spread thickly. MICROWAVE: Melt your chocolate slowly in the microwave in short bursts. No longer than 30 seconds at a time. You need to check that the chocolate has started to melt, then take it out of the microwave and stir until all the lumps have melted with the residual heat. DOUBLE PAN METHOD: This involves using a saucepan and a glass bowl. Bring a small amount of water to the boil in your saucepan and then turn the heat down low. Break your chocolate into small pieces and place into a glass bowl, then put the glass bowl into the simmering water and allow to melt. PLEASE NOTE: Do NOT melt your chocolate over direct heat! This will cause it to heat too quickly and it will dry out and may even ruin your saucepan! Also make sure that no water gets into your chocolate mix as this will ruin the chocolate. Once your glass bowl has enough melted chocolate, remove from the heat and gently spoon it into the egg mould. 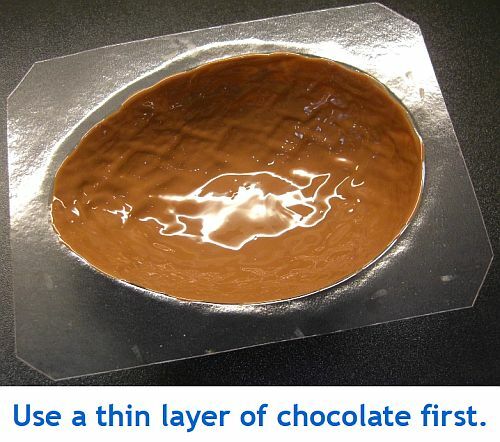 Use the back of a spoon to spread the melted chocolate over the inside of the mould. For this first stage you'll only need to cover a thin layer. Place the mould in your fridge on some greaseproof paper upside down for about 10 minutes to allow the chocolate to set. By placing it upside down - i.e. open side down - this will help the chocolate to thicken around the edges, which is where you'll eventually be sticking them together. When you're ready, take the mould out of the fridge and then you'll be able to add some more melted chocolate onto the inside of the mould to make it thicker. Repeat this as many times as you like until the egg is as thick as you want it to be. STICKING THE TWO HALVES OF THE EASTER EGG TOGETHER. The easiest way to do this is to prepare a baking tray by preheating it in an oven. When it has warmed up all you have to do is take the two chocolate halves which you have taken out of the moulds and rub them face down on the warm tray. This will melt the chocolate slightly and you'll be able to press them together where the chocolate has melted which will stick them together. Once they've stuck together you can use a kitchen knife to tidy the edges up. (SIDE NOTE)! 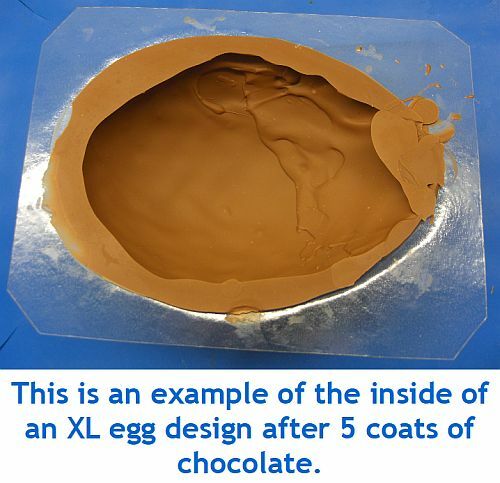 : Of course if you want to make solid chocolate eggs then all you need to do is fill the half eggs to the top and stick them together with a bit of melted chocolate! 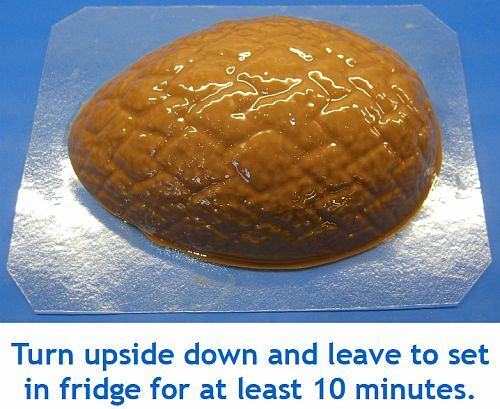 This is the easy way to do it, but you won't get hollow eggs so you won't be able to put in any treats inside the egg! I WANT TO MAKE MY OWN EASTER EGGS! SHOW ME YOUR MOULDS!